Choosing a cloud solution for your business that’s both flexible and cost effective. There are a bewildering assortment of terms being bandied about in the Cloud computing world, particularly in reference to running your whole desktop in a hosted environment: Hosted Remote Desktop, Virtual Desktop Infrastructure (VDI), Hosted Applications, Desktop as a Services (DaaS), but if you’re in the process of considering what it the best cloud solution for your business you need to know that these technologies are not necessarily the same. Virtual computing is inherent in all the technologies we are discussing, the ability to run multiple “Guest” operating systems on one physical “Host” computer. Virtual Desktops are individual guest operating systems running on a 1 to 1 (user to operating system) basis from a central server or server farm. The desktops behave like any desktop running on a physical PC, and will typically run a desktop operating system such as Windows 7, 8 or 10. Profiles and data are usually stored centrally. Virtual Desktops enable the users to logon on to any computer and connect to their unique desktop. Deployment of new desktops is therefore usually very quick and local hardware can be very basic, often just thin client terminals. While there are many cloud providers who supply cloud hosted versions of VDI they are more common in large corporations managing their own IT infrastructure on site. Hosted Remote Desktops are very different. Instead of one virtual desktop operating system per user Remote Desktops will typically use Windows Server operating systems and may have several dozen users on one powerful server. These desktops generally use Microsoft Remote Desktop Services (previous known as Terminal Services) to present a Windows desktop to the user and will look and feel very similar to a real or a VDI desktop. The only difference to the user is that they are on Windows Server instead of on say Windows 10. The user is seldom aware they are running on a different operating system and the applications the users run work exactly the same. Being “Hosted” they are managed by a cloud provider, often connecting to applications and databases hosted in the providers data centre, potentially removing the need for any local back end infrastructure for the business, dramatically reducing the upfront costs of providing the infrastructure to share applications and data. Hosted solutions are usually provided on a monthly subscription basis allowing user numbers to change from month to month as required by the business. Hosted Applications and Remote Desktops are two sides to the same coin. At the backend everything is the same, the only difference is how the user connects. A Hosted Application removes the “desktop” wrapper of a Remote Desktop, all the user sees are icons for the applications they want to run. When the application starts it feels no different than if it was running locally on the PC. The applications can also be launched from a web portal, especially handy if you are on a strange computer such as in a hotel. Hosted applications are often used by software vendors as a way of supporting the sale of their software by removing the need for their customers to buy local servers. Hosted Applications can also be supported by additional hosted infrastructure such as Hosted SQL Servers, Web servers, or fast network storage, all from the same data centre network guaranteeing performance. DaaS is again one of those terms that is used for different technologies. 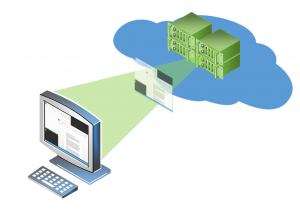 It can be used to represent a VDI solution if cloud hosted, but is more typically associated with Remote Desktops. A good chunk of the memory and CPU on a computer is taken up by the operating system. On a Remote Desktop/Hosted Application environment there is only one operating system for dozens of users. Whereas on a VDI solution each user has their own OS so the underlying physical hardware cannot support as many users, so making the solution more expensive, plus a higher carbon footprint. A computer’s operating system will require about 40 – 50 GB of storage plus plenty of headroom for updates. The installed applications also need their own disk space, Office 2016 for example will need at least 3GB. Multiply this by the number of virtual desktops in a VDI solution and it adds up to a significant amount, therefore more added cost. I’ve already mentioned that a VDI solution will require more overall resources than a Remote Desktop. Another consideration, especially for small and medium scale implementations, is that the applications and databases are usually on the same server as the client application meaning application performance is at its optimum. Where databases are on a separate SQL server this will likely be on the same network and fibre connected to the application server. When installing applications to multiple virtual desktops you have to deploy it to each one as if they were physical machines. This either requires a lot of time from your IT support, or investment in application deployment technologies such as Microsoft System Centre, and skills to package the application for deployment. On a Remote Desktop you just have to install the application once. The same applies when it comes to upgrading your operating systems, with Remote Desktops you just have one server to upgrade/replace, with VDI you’re looking at a major project. A virtual desktop can potentially suffer from as many issues as a physical PC. The advantage of VDI is that if it does have an issue it is usually isolated to that desktop. An issue on a Remote Desktop is potentially affecting the whole server. In reality though server issues causing disruption or downtime are exceedingly rare. Microsoft Windows Client Access Licences (CALs) and Remote Desktop Services CALs can be provided under the Service Providers Licence Agreement (SPLA) meaning your cloud hosting provider can rent you the licences on a month by month, user by user basis. The Windows Server licence will usually be covered by the hosting provider using a data centre licence. Desktop operating systems such as Windows 10 are not legally available under SPLA so customers would need to purchase full Windows desktop licences for each user. If you are handing over your data and IT operations to a third party you need to make sure they are competent. Check how long they have been trading, what their credit rating is. Are they ISO 27001 certified? Do they own their own equipment? What Tier is the data centre? What high availability and disaster recovery systems do they have in place? While Internet outages may not be the responsibility of the provider, unless their equipment is at fault, any outages will impact your business. Make sure the provider offers a Service Level Agreement and will compensate for outages caused by their infrastructure. With all hosted solutions whether VDI or Hosted Remote Desktops/Applications you should expect that the computers are supported and maintained by the hosting provider, this should include Anti-Virus and Windows Update management but also backups of the operating systems, databases and documents. For more information on how cloud technologies can benefit your business you can read more about our Remote Desktop service online or alternatively you can fill our our online contact form or call us on 01282 500318.